Famous Siena attractions are the Siena Town Hall, Bell Tower, Piazza del Campo, Duomo and the San Francesco Basilica. Other top attractions include the Fountain of Joy, Mercanzia Bench, Piazza del Mercato and the Duomo Statues. 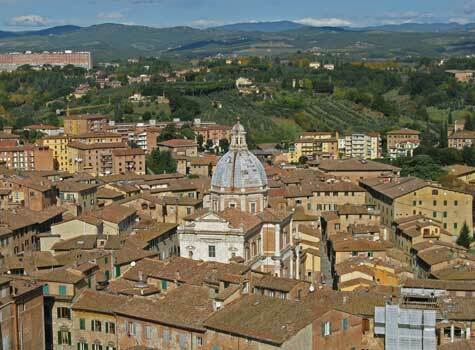 Excellent hotels can be found in the heart of Siena, in the Chianti region and near the Florence airport. The Stazione di Siena is Siena's central train station. The nearest large airport to Siena is the Amerigo Vespucci Airport in Florence.